Inflicts damage to the attacker on contact. Its Speed stat is gradually boosted. X They form packs to attack boats and rip out their hulls to sink them. They live in rivers in the jungle. X Schwärme von Kanivanha haben in Dschungelflüssen schon so manches Boot zerbissen und versenkt. X Il s’attaque en banc aux bateaux dont il dévore la coque. Les rivières de la jungle forment son habitat. X Atacan en grupo a los barcos y los hunden a base de bocados. Habitan en los ríos de la jungla. X I Carvanha attaccano le navi in branco e ne strappano gli scafi a morsi. Abitano i fiumi della giungla. X 집단으로 배를 공격해 배의 밑바닥도 물어뜯어 가라앉힌다. 정글의 강에 서식한다. Y It lives in massive rivers that course through jungles. It swarms prey that enter its territory. Y Es lebt in reißenden Flüssen, die sich ihren Weg durch den Dschungel bahnen. Es fängt Beute, die sich in sein Gebiet wagt. Y Ce Pokémon vit dans les fleuves qui traversent les forêts tropicales. Il attaque en groupe ceux qui s’aventurent sur son territoire. Y Habita caudalosos ríos que atraviesan las junglas. Si alguien invade su territorio, acude con más de su especie. Y Vive in grandi fiumi che attraversano la giungla, lanciandosi in branco contro gli intrusi. Y 정글을 흐르는 큰 강에 서식한다. 영역에 섞여 들어온 먹이를 집단으로 덮친다. Omega Ruby If anything invades Carvanha’s territory, it will swarm and tear at the intruder with its pointed fangs. On its own, however, this Pokémon turns suddenly timid. Omega Ruby Wenn jemand Kanivanhas Revier betritt, schwärmt es aus und schnappt mit seinen spitzen Zähnen nach dem Eindringling. Wenn es allein ist, ist dieses Pokémon sehr scheu. Omega Ruby Si un intrus s’aventure sur le territoire des Carvanha, ils se ruent sur lui et le mordent à l’aide de leurs crocs acérés. En revanche, lorsqu’il est seul, ce Pokémon devient tout à coup très timide. Omega Ruby Si algo o alguien invade el territorio de los Carvanha, se acercarán en masa y harán trizas al intruso con los afilados colmillos. Sin embargo, cuando están en solitario, estos Pokémon se vuelven tímidos de repente. Omega Ruby In caso di invasione del proprio territorio, i Carvanha si lanciano in branco contro gli intrusi annientandoli senza pietà. Preso singolarmente, invece, questo Pokémon diventa estremamente timido. Omega Ruby 영역을 침범하는 자는 집단으로 덤벼들어 뾰족한 이빨로 갈가리 찢는다. 혼자가 되면 바로 소극적인 모습을 보인다. 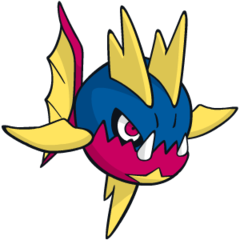 Alpha Sapphire Carvanha’s strongly developed jaws and its sharply pointed fangs pack the destructive power to rip out boat hulls. Many boats have been attacked and sunk by this Pokémon. Alpha Sapphire Kanivanhas starke Kiefer und seine spitzen Zähne verfügen über die zerstörerische Kraft, Bootsrümpfe verschlingen zu können. Dieses Pokémon hat schon viele Boote versenkt. Alpha Sapphire Les mâchoires surdéveloppées de Carvanha et ses crocs acérés sont si puissants qu’ils peuvent déchirer la coque des bateaux. De nombreux navires ont été attaqués et coulés par ce Pokémon. Alpha Sapphire Carvanha, gracias a las descomunales fauces de afilados colmillos que tiene, es capaz de hacer trizas un barco. Son muchas las naves que han sufrido el ataque de este Pokémon y han acabado naufragando. Alpha Sapphire Le sviluppate mascelle di Carvanha e i denti estremamente appuntiti e affilati hanno una potenza distruttiva tale da sventrare la carena di una nave. Già molte navi sono state attaccate e affondate da questo Pokémon. Alpha Sapphire 발달한 턱과 날카롭고 뾰족한 이빨은 배 밑바닥을 물어뜯을 정도의 파괴력을 지녔다. 샤프니아에게 습격당해 가라앉은 배가 많다. Sun Each school has its own territory. Any intruders are mercilessly attacked with fangs bared. Moon If they scent the faintest trace of blood, they rush to attack en masse. When alone, they’re rather cowardly. Ruby Carvanha's strongly developed jaws and its sharply pointed fangs pack the destructive power to rip out boat hulls. Many boats have been attacked and sunk by this Pokemon. Sapphire If anything invades CARVANHA's territory, it will swarm and tear at the intruder with its pointed fangs. On its own, however, this POKeMON turns suddenly timid. FireRed It lives in massive rivers that course through jungles. It swarms prey that enter its territory. LeafGreen It lives in massive rivers that course through jungles. It swarms prey that enter its territory. Emerald CARVANHA attack ships in swarms, making them sink. Although it is said to be a very vicious POKeMON, it timidly flees as soon as it finds itself alone. Diamond They swarm any foe that invades their territory. Their sharp fangs can tear out boat hulls. Pearl They swarm any foe that invades their territory. Their sharp fangs can tear out boat hulls. Platinum They swarm any foe that invades their territory. Their sharp fangs can tear out boat hulls. 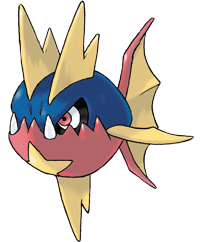 HeartGold They form packs to attack boats and rip out their hulls to sink them. They live in rivers in the jungle. SoulSilver They form packs to attack boats and rip out their hulls to sink them. They live in rivers in the jungle. Black They swarm any foe that invades their territory. Their sharp fangs can tear out boat hulls. White They swarm any foe that invades their territory. Their sharp fangs can tear out boat hulls. Black 2 They swarm any foe that invades their territory. Their sharp fangs can tear out boat hulls. White 2 They swarm any foe that invades their territory. Their sharp fangs can tear out boat hulls.